What is difference between save and saveOrUpdate in Hibernate are most important in any Hibernate interview. Hibernate Session is the interface between java application and hibernate framework. It provides some methods to move an object from new or transient state to persistent state. For example, save(), saveOrUpdate() and persist() methods are used to store an object into database. However, they have some differences about usage. 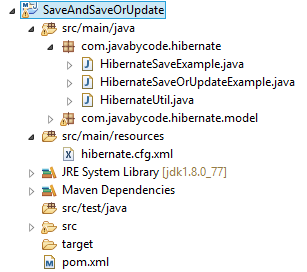 Now we will create examples to clarify the difference between save and saveOrUpdate in Hibernate. Hibernate: select student0_.id as id1_1_0_, student0_.CODE as CODE2_1_0_, student0_.ENTERING_DATE as ENTERING3_1_0_, student0_.NAME as NAME4_1_0_, student0_.NATIONALITY as NATIONAL5_1_0_, address1_.ADDRESS_ID as ADDRESS_1_0_1_, address1_.CITY as CITY2_0_1_, address1_.COUNTRY as COUNTRY3_0_1_, address1_.STREET as STREET4_0_1_ from STUDENT student0_ left outer join ADDRESS address1_ on student0_.id=address1_.ADDRESS_ID where student0_.id=? Hibernate: update STUDENT set CODE=?, ENTERING_DATE=?, NAME=?, NATIONALITY=? where id=? the saveOrUpdate method again, here the update query is executed since the data exists. Main difference between save and saveOrUpdate method is that save() generates a new identifier and INSERT record into database while saveOrUpdate can either INSERT or UPDATE based upon existence of record. If object already exists in the database, save() method will fail. The save() method returns the identifier generated by the database. On the other hand, saveOrUpdate() can do INSERT or UPDATE depending upon whether object exists in database or not. saveOrUpdate does a select first to determine if it needs to do an insert or an update. Another key difference between save() and saveOrUpdate() method is that save() method is used to make a transient object to persistent state but saveOurUpdate() can make both transient (new object) and detached (existing object) object into persistent state. So that saveOrUpdate() is often used to re-attach a detached object into Session. That’s it on the difference between save and saveOrUpdate in Hibernate tutorial.